Send them to AA, these pumpkins on the party steps. New Mexico has a director of culture. The culture and industry in our state is an important part of the economy. This photo is from the annual government report on arts and culture. The culture one finds here is steeped in the 400-year history of Santa Fe. I have friends here this week -- the first time girlfriends have come to play since I moved from NYC. No one came to play and stay in Atlanta when we lived there and Houston, really, wasn't a destination city for fun. In Texas, everyone goes to San Antonio. So I'm off entertaining my friends, sharing with them what I know and love about New Mexico. On the agenda: museums, galleries, shopping around the plaza, spas like Ojo Caliente or Ten Thousand Waves, hiking in the mountains at sunrise, Northern New Mexico cuisine - perhaps a cooking class, Indian Pueblos and ancient ruins and arts including textiles and jewelry and our Farmer's Market. Perhaps the best thing might be sitting by a pinyon fire talking with hot chocolate made from Mexican dark chocolate. The joke is that The David came to America for a special exhibit and now he's returned to Italy, fat. Used to be that Fat Cats, linguistically, stood for those who were rolling in the dough, financially speaking. Now the fat cats are those rolling in the junk food and I wonder why food policy is not a campaign issue. Who are the Fat Cats now? Junk food producers and eaters. My favorite food writer Michael Pollan (also Gary Paul Nabhan, an ethnobotanist combines food and culture writing) wrote a food article addressed to the future president. Food marketing to children is obscene and just way out of line. 44 major food and beverage marketers spent $1.6 billion to promote their products to children under 12 and adolescents ages 12 to 17 in the United States in 2006. The report finds that approximately $870 million was spent on child-directed marketing, and a little more than $1 billion on marketing to adolescents, with about $300 million overlapping between the two age groups in 2006. Marketers spent more money on television advertising than on any other technique ($745 million or 46 percent of the 2006 total.)... but, themes from television ads carried over to packaging, displays in stores or restaurants, and the Internet. That same year, cross-promotions tied foods and beverages to about 80 movies, television shows, and animated characters that appeal primarily to children. In total, the companies spent more than $208 million, representing 13 percent of all youth-directed marketing, on cross-promotional campaigns. What food producers don't want you to know is that they "support studies that minimize health concerns associated with their products and junk food makers donate large sums of money to professional nutrition associations. Profits aren't found in minimally processed foods and whole foods." The Fat Cats are the immoral people in this process contributing to our societal obesity and our policies must change. Moms, we've got to make a difference. P.S. Mother, thanks for emailing me that Fat David photo, you skinny minnie. September 28th is when the financial crisis jumped to a huge named story as it exploded in news references (see the Google Trend chart that lists news references as compared to another term then in use, "Wall Street Crisis", which became "The Financial Crisis"). Sept. 28 is when I began studying the story as it was played out in the media. It has become an ongoing top story driving media to change to provide 24/7 real time news. A study by ComScore for September found that "The Financial Crisis" caused a spike to online financial news sites as markets became chaotic, major banks crumbled and Congress worked to pass the $700B bailout to stabilize the markets. According to the study, "Business/finance – news/research web sites saw a substantial increase in visitation in September, gaining 9 percent to more than 64 million visitors, while also increasing 16 percent in pages viewed and 29 percent in total time spent. These increases suggest that not only were more people visiting the sites in the category, but that they viewed more articles and content for longer periods of time on average." Big winners: Yahoo! Finance led the category with nearly 20 million visitors, a 30-percent jump from August; FoxBusiness.com (up 127 percent to 1.2 million visitors); and Google Finance (up 67 percent to 1.4 million visitors). Major media outlets are scrambling to cover the story. Good coverage means stronger audience ratings and what could be better for some of the media than to keep updated stories as the Dow and business stories break in real time? Opportunities like these are ones to gain new readers. Some say this story could be the death of network news and print daily media in some markets. The day I started studying the media, the New York Sun shut down. The Wall Street Journal, the historical business daily, fails to put a date and time stamp on its online version making it impossible to determine how fresh the news is. Immediacy and ability to keep readers informed is leading to quick changes. I would bet that WSJ sees a decline in online readers over this story. Last week the NYTimes and WashPost began to link to outside sources. On Thursday last week, WashPost launched a special section, Economy Watch, to give better understanding of the "unfolding financial crisis" and Editors weblog notes that some features include all sorts of ways to interact with the story. A link to the section runs across the front of the online front page, a nice feature that allows readers to jump right to that section. Last week was the week that the story jumped to major importance on online national news pages with new graphics to focus audience attention, links, timestamps and section heads. Even Drudge and the Huffington Post moved to make the story the top one. Drudge put a real-time Yahoo! finance Dow chart on the top-left of the page and the Huffington Post created a BigNews page for financial stories. This has been a complicated story to tell and one that has breaking news that can impact markets. During the week of October 6 - 12, the Project for Excellence in Journalism found that the The Financial Crisis was the top story in Online News stories and newspapers while the 2008 Campaign filled 62% of the cable news and was the top story across all media. According to the Pew News Index, one can see how the story is covered in various outlets during the week of October 6 - 12: Just to compare two media outlets in covering The Financial Crisis, radio gave the 2008 Camp 55% attention and the financial crisis/ bailout got 24% of the radio news attention. In contrast, newspapers gave 42% of the space for news stories to the financial crisis/bailout while campaign news got 25% of the space. A Pew Research survey for People & The Press on October 15 found that Americans are concerned about the nation’s economic problems almost to the exclusion of every other issue. The WashPost has quickly scrambled to provide deeper information to readers. It's Economy Watch link, across the top of the front page last Thursday and Friday, moved off front page to the top of the Business section after Friday and Monday's markets calmed down. The market is up today, so many might have sweet dreams. With the intensity of the final weeks of the long, long, long presidential campaign going hand-in-hand with market woes, I've been thinking of what mothers do when things get intense. Cook something comforting, have a cuppa tea, and.... hum. Really, there is something good about the vibrations that come from humming. Some women work out stress by going into cleaning mode. Mothers coo and cluck and fluff and shush-- mothers of all ages. We need to know the remedies and what works best, when to apply them and when to just.... hmmmmm. Let things be, protect the nest, settle back or go on attack. Well, too bad Mr. Clean can't go clean up the messes since the dude is dead (may he have sweet dreams in the hereafter). When times get tough, the Queen goes to work at McDonalds. (this is humor). Today, Monday, is the first trading day after the anniversary of the '87 stock market crash known as Black Monday, and, these pesky financial bugs are more complicated now and have been making many toss and turn. Our Global Financial Crisis -- as we've named it -- closed Friday at a stable state after a volatile two weeks. Just like bedbugs are tough to deal with, these weeks and months are requiring fixes. So... dum de dum, hummm, hummm. Sweet dreams. update: My Oklahoma friend tells me that Norman, OK artist Mike Wimmer created the "new" Mr. Clean back in the late 80's. The guy he used for Mr. Clean is a local firefighter and dad to one of her daughter's high school friends. How does the Pareto principle, or the rule of 80/20, apply to parenthood? Named for the Italian economist Vilfredo Pareto, who noticed that 20% of the population held 80% of the wealth, can this be applied to our families? Do 20% of the children get the most attention? Is 80% of the home less tidy than the rest? Are we good mothers if we are successful 20% of the time and really, isn't it true that 20% of our actions are responsible for 80% of the consequences? As much as we try, as parents, to be fair, does this rule that explains clumping and a law of nature of uneven balance that happen anyway? Do children mind 20% of the time? Do 20% of the children excel in the classroom while 20% excel in the athletic arena? Is this why the gifted and talented programs are so sought-after, as teachers can teach to the top, rather than the middle? The idea of dumbing down - teaching to the middle - and the idea of the cream rising to the top is a principle we've accepted. As a PTA officer, or organizational leader, a rule of leadership is to influence the top 20% and pay attention to that group in order to have the most impact and to get support for reaching the goals. If 20% of the group is naysayers and armchair critics, responding to the negative 20% will get a group nowhere. If you let the bottom 20% command all the attention, the goals will be diluted. Paying attention to the top 20% means the middle group will float in the wake. The middle is influenced by the Pareto 20% in any case. Why is this hard for parenting and our attempts to be fair? Because we want the least of our children to succeed so we work hard to be fair and pay attention to all. Is unconditional parental love an exeption to the Pareto Principle? Not being in WDC, let alone Skopje or Vilnius, I couldn't see the street statements supposedly made in capital cities in many countries Saturday which were organized by people concerned about our shift to a surveillance society/database state. We can see this as an example of how the shape of how we work and live in our world has shifted. This worldwide October 11 event was coordinated with wikis and websites. If you want to see it, or see photos that pertain to surveillance and fear and freedom, you can go online and get a worldview from people who take photos, upload them and share them with photo tags. Just like our grandmothers could use their networks in over-the-backyard-fence discussions, wikis can network people. Imagine that your backyard fence can encompass the whole world. While we hope for our markets to lift, and wonder about how things will shake out, I think this one example is just one of many that indicate that we have crossed to the next epoch, like from The Dark Ages to The Renaissance. These letters, at left, were developed in 1525 by Albrecht Durer as an artistic expression of a letter art form with Roman-esqe structures that became archetypes of the carved letters used for European writing and type. They have an echo of the Latin manuscripts that go back to the first century BCE. Times New Roman is the font we read and typed with most of the time last century. Georgia, a type for digital screens, carries on that tradition. We've gone from ink on sheepskin for the few educated to Gutenberg Bibles to anything printed and distributed by anyone today. The shape and shift of our letters has lifted with us to new times just like literature itself - the word - came over with William the Conqueror to England and gave the French word for art and culture to the English and here we have it today. Little could that king have thought that cameras would be on every corner, there, monitoring the citizenry. He put together his sheriffs and lords to run the villages and manors and set up a structure of control. We have sheriffs today, thanks to him. Yesterday, however, London had a big gathering of people concerned that there is a camera there for every 14 people. They shared photos illustrating their surveillance state online and made one big collage from them and then posted their photos of the event with the giant photo collage. You can see it, too. This one is The Big Picture from the Open Rights Group, London. This is one of the reasons I love living in New Mexico. I had to completely stop and bear witness to this storm. Isn't this just gorgeous. This might be my favorite photo, ever, of all my years with photography. What a moment. I should enter it in a contest, offer it for professional publication, commercialize it, sell it. But what am I doing? Putting it out there and letting it loose in the world. For free. Click. It's out of my control. Some of the best things in life are free. I give you my no-cost experience. If you use this, please link back. For a room with no views I put together a digital slide show of my western landscapes from Colorado and New Mexico. I used iPhoto and iMovie on my mac and it plays on a tv screen like a digital photo frame. It gives my room views. Stunning views: The West is (so) within the room. Next to make: digital art (think MOMA and MET art - Renoirs and such). 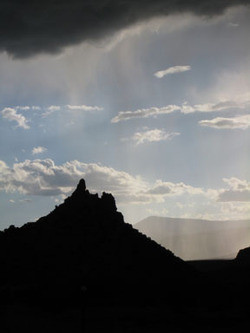 Michael Hearne, a New Mexico musician/songwriter, won awards for his song, New Mexico Rain. A lead story and photo for the late Saturday NYTimes issue, Overfeeding on Information, just popped up. Or should I say, latest issue. In today's mediascape, updates are continuous. Breaking news? Real time coverage? With this global financial crisis we are facing, we are primed for and we pay attention to threats. Think how you were glued to the tv on 9/11. This Global Crisis is a perfect story for media to feed on as we are riveted by stories that involve our health and well-being. This story is hitting everyone in the pocketbook. Plus, we're numbed by the politics. That this story is hitting our Newspaper of Record as a lead story after last week's meltdown (officially a "Recession" and words like Panic and Meltdown and Greatest Financial Crisis Ever were words used to describe the market that saw a 1,874 point decline this week) is an indication not only of media and its power to provide us with 24/7 real time information, but the nature of our global world and how we are using and getting information. You want the real news, the best news, the truth of the matters, the latest facts. NYTimes stories are updated with red timelines and the front page online has a dateline and a redline time stamp for the last update. With a passion for media (undergrad in Journalism, grad degree in media studies completed last year) studying this crisis in the mediasphere is no slight thing. Media and journalism in this 24/7 world is chaotic, stressful and difficult to keep up with in any sort of linear fashion. Journalism expert Jeff Jarvis writes that the old building block of journalism - the article- is now obsolete. Jarvis believes we haven’t yet created the proper elemental unit of coverage of stories like these and I wonder if it makes facts less relevant as it is just impossible to keep up with things. He thinks that depth comes from the links (which really is a nodal, rhizome-like, non-linear way of thinking) and working with knowledge which is altering journalism (and I would say and Nick Carr and others believe, is changing us in the process). Last time I studied front pages of major newspapers for a national story coverage study, I spread out the Atlanta Journal-Constitution, the Wall Street Journal and the New York Times on the kitchen table, measuring stories in column inches and photos by column width. It is nearly impossible to do the same today. I pulled together a day's end compendium of the headlines of just a few major media screenshots. With the NYTimes being traditionally, in our American society, a paper-of-record, one way we archive our cultural and social news and business, how do you record the snapshots of the day? They are changing continuously and updated. So how do you know how information and truth morphs? WaPo Journalist Dan Froomkin, in looking at our political media coverage in an article for the Nieman Foundation for Journalism at Harvard, says, "the fact is, facts don't seem to matter anymore." I think he may be right. We can't separate the wheat from the chaff in all the noise. All the fact check sites have respect but no traffic. That is where truthiness becomes more relevant than the truth itself. Just as Tina Fey's SNL skits resonate more than the real thing. The NYTimes article Overfeeding on Information notes that "this explosion of information technology, when combined with an unusual confluence of dramatic — and ongoing — news events, has led many people to conclude that they have given their lives over to a news obsession. They find themselves taking breaks at work every 15 minutes to check the latest updates, and at the end of the day, taking laptops to bed. Then they pad through darkened homes in the predawn to check on the Asian markets." Part I of the Media Study and Part II of the Media Study on the US Financial Crisis are ongoing works in progress. I started blogging this with the post,Bigge$st Cri$i$ and Media and most recently wrote about The Art and Names of the Global Financial Crisis.